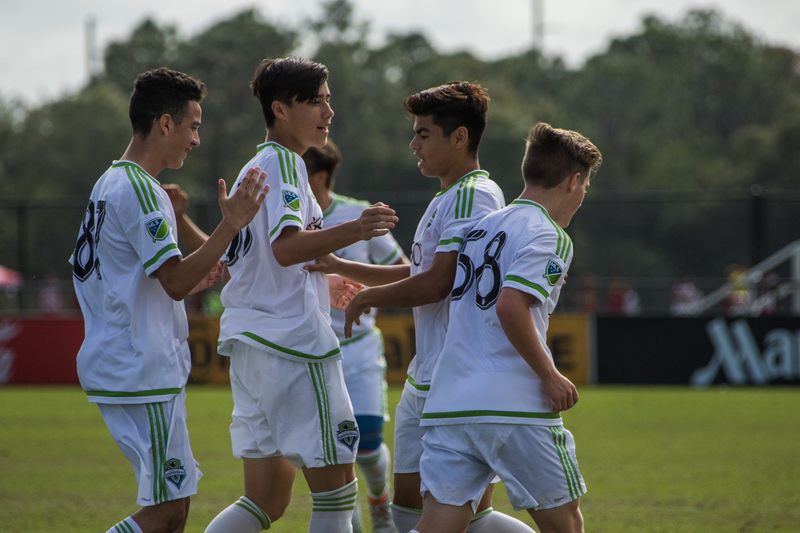 LAKEWOOD RANCH, Fla. (Dec. 5, 2016) - Azriel Gonzalez's brace and another strike from Alfonso Ocampo Chavez lifted Seattle Sounders FC U-15/16 to a 3-1 win against Columbus Crew SC U-15/16 in the final featured match of the 2016 Development Academy Winter Showcase at Premier Sports Campus. Sounders FC forced the attack early on and were rewarded for the efforts in the fifth minute. A cross from the right was popped up by Crew SC defender Kalen Nichols before Gonzalez swarmed the area and unleashed a curling bullet inside the right post to push Sounders ahead 1-0. Crew SC almost leveled the score five minutes later when Sebastian Berhalter's cross from the right swung to Isaiah Parente whose first touch fell for Michael Wampler. The Crew SC forward collected, but was unable to get a clean touch as the ball slowly rolled to Sounders FC goalkeeper Sam Fowler. Despite some more possession from Crew SC, Seattle found a second goal via Gonzalez in the 24th minute. A ball over the top was taken down well by Alfonso Ocampo Chavez, before he held up at the top of the area and laid the ball off to Gonzalez in full stride. The Sounders FC forward drove into the box and side-stepped a defender before placing his effort to the bottom right corner. Crew SC came close again before halftime when Colin Biros went on an impressive run through midfield and slid the ball to his right for Parente, who powered an effort to the top right corner, forcing Fowler to push it out for a corner kick. Sounders FC opened up a 3-0 lead after the break when Gonzalez overlapped on the left side and turned in a low cross for Ocampo Chavez whose deft touch at the near post left Crew SC goalkeeper Alec Srodawa flat-footed in the 46th minute. Columbus responded with a goal of their own, finally finding the back of the net in the 50th minute. Kalen Nichols did well to work his way up the right before centering for substitute attacker Abdoulsalan Faqi, who put his one-time attempt back across goal as Fowler fell to his left, taking the score to 3-1. Crew SC continued to pressure and had one more great chance when Berhalter gathered a pass at the top of the area and attempted to chip Fowler, only to see the Sounders FC goalkeeper fall backwards and tip the ball over the bar for a corner kick, preserving Seattle's 3-1 win. With the result, Seattle Sounders FC U-15/16 move to 5-3-4 on the 2016-17 campaign, while Columbus Crew SC U-15/16 fall to 9-4-1.